The Kindle Paperwhite is a pivotal step forward for the technology of ereaders. It makes previous generations feel like a pulpy paperback held up next to an ornately illustrated tome. In short: this is the best ereader you can buy. An e-ink reader with a frontlight and a high-res capacitive touchscreen. What Is a Frontlit Display? Anyone who wants an ereader with a great screen. Which is basically anyone who wants an ereader. Paperwhite ditches the chip-prone silver paint of the previous Kindle generation for a black finish, a soft-touch-painted back panel, and its new capacitive touch sensor lets it slim down, with a much thinner bezel. It's the stealth bomber version of the Kindle you know. You know how ereaders work. This one just works better. Starting with the standout feature: The frontlight is an easy-on-the-eyes light that illuminates the screen without stressing your eyes. You can slide the brightness up or down, and read in bed at night or anywhere else that's dimly lit without lighting up the whole room. It's also—importantly—an improvement over the frontlight in the Barnes and Noble Nook Simple Touch with Glowlight. The Paperwhite's light is more evenly distributed, and easier to control because of its capacitive touch sensor. The change to capacitive touch from IR is a bigger deal than it sounds. Interacting with the Kindle for stuff other than turning a page is actually pleasant now, not clunky and slow. You especially feel the difference when you're changing settings, like Wi-Fi, or using the onscreen keyboard. Aside from that glorious light, text on the new screen is sharper, in a way that's instantly noticeable. Everything is tack-sharp. The PPI boost, from 169 to 212, makes a huge difference in how small you can make the font with it still being readable. On the old Pearl screens previous e-ink readers have used, small text would be pixelated, and degrade further as you turned pages, until the display finally "flashed" to refresh it self (once every five pages). That issue hasn't totally disappeared here—it still degrades and flash refreshes—but it's far less pronounced. Finding stuff to read is as easy as ever. Anything you've ever bought from the Amazon store is available in the "Cloud" tab of your library. You can also buy a book online and send it directly to your Kindle, where it will show up almost immediately, or browse on the Kindle itself (another chance to be thankful for that capacitive touch display). And in a nice touch, books that are available to borrow for free as a Prime member are marked off with an Amazon Prime logo. The screen and the light sort of work together as one mega-benefit, because the light actually feels like part of the display. There is a liiiittle bit of banding around the bottom of the screen, where the four LEDs produce light for the whole device, but it's not as pronounced as it is on the comparable Nook. It's not ideal to hold. The Paperwhite is light and small and a definite improvement over the Kindle Touch in ergonomics. But it's also not quite as comfortable to hold one-handed as the Nook Simple Touch, due to the relatively small side bezel. And since it's a touchscreen, you've got to worry about blasting off to another page by accident. The frontlight's not just for dark rooms; you actually end up getting a lot of use out of it in dim or even average lighting conditions, to neutralize ambient shadows. It feels strange popping on the light in places where you would never use a traditional book light, but it's useful. The contrast difference between the Paperwhite and the Nook Simple Touch or the Kindle Touch is definitely noticeable. When it really comes through is on the third and fourth pages after a flash-refresh (when the e-ink screen blinks to all-black to reset itself). Sharpness starts to degrade no matter what, but the Paperwhite's text at least remains readable. The contrast difference is also magnified when the light is on; any imperfections are more noticeable (and again, the Nook has more). There is still e-ink ghosting, where the previous page's text is outlined on the current page. But it actually seems less pronounced on the Paperwhite. Still, you have the option to flash-refresh every page turn if you insist. Having just one physical button—the power button on the bottom of the device—is still a bit of a hassle. The Nook has an additional physical Home button to bring up its menu, while you've got to tap the upper part of the screen to access the Paperwhite's. X-Ray—Amazon's feature that shows you the important characters on a page, or in the book as a whole—is cool, but still feels pretty extraneous. You won't use it much, especially after the novelty wears off. Time to Read, however, is really useful. It's a new feature that analyzes how fast you typically read, and gives you an estimate of how long until you're done with your chapter, or the book as a whole. It seems reasonably accurate—though at times it just seems to guess a minute per page turn—and only really feels useless when you're reading a book with humongous chapters and something dumb like 3 hours 24 minutes pops up. There is a fine grain added to the surface of the screen, to make swiping and touching it feel more tactile. It works well, and makes you want to touch the screen more than you have to. The case for this year's Kindle (and Kindle Fire HD, actually) is a huge improvement from last year's. It's textured, with a magnet to automatically turn the Kindle on when it opens. It definitely helps with the slight "awkward to hold" issue. I'm a gadget nudist, but find myself using the case quite a bit. The black finish of the bezel collects smudges a little more than you'd like. They rub out quickly enough, but it's slightly distracting. Battery life with 3G, Wi-Fi, and the frontlight on for prolonged reading sessions drained about 30 percent over the course of a week. It's rated at eight weeks with wireless off and the light on 11/24 for an hour per day. We tossed a set of keys onto the screen a few times from about three feet (don't tell Amazon), and didn't wind up with any light pillars shooting out of the display. So it's sturdy. Absolutely. 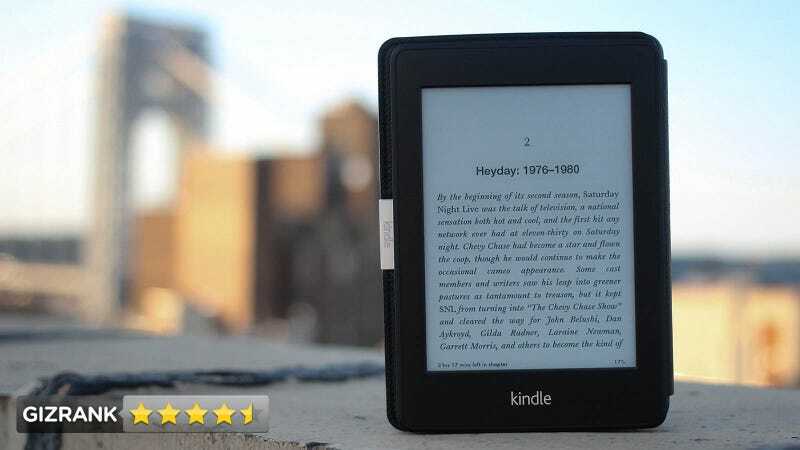 The Paperwhite is a great ereader, and the superb screen quality, easy-to-use frontlight, and improved capacitive controls make it an easy choice. The only reason to not get it would be if you really love physical buttons, in which case you should probably look to the Nook Simple Touch with Glowlight, which is now $120—in line with the Paperwhite's Special Offers model. Otherwise, the Kindle Paperwhite is the best ereader out there.